Cold, Rain, Rough Seas and Sleep in’s!!! « The Esteemed Mr Kirk Hille!!! This was always going to a tough morning. It was bitterly cold, Mettams Pool was ages away and my bed was just so damn warm. After a 30min drive I arrived at Mettams Pool and caught up with Kirk and discovered that the third person who was supposed to turn up decided to stay in bed. Nice Work!!! LOL. Anyhow they didn’t miss much. Kirk and I stayed there and tried to get some good photos out of a hard situation. It rained on us, the wind was howling and the sea was pounding into the rocks sending spray everywhere. Anyhow we made it out alive!!! 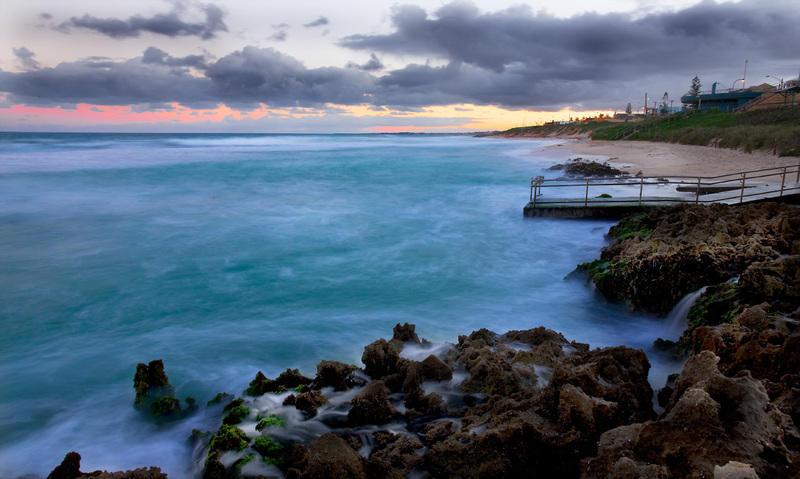 This entry was posted in Australian Landscapes and tagged australia, kirk hille, landscape, mettams pool, ocean, perth, seascape, sunrise, water, western australia. Thanks for stopping by and commenting I really appreciate it. Did you have a favourite photo?